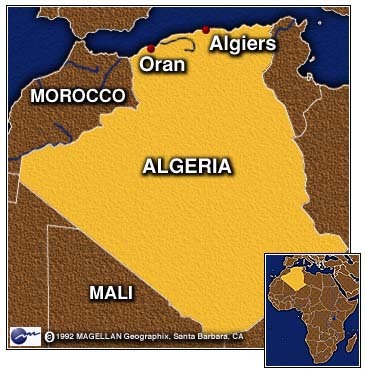 ALGIERS, Algeria (CNN) -- More than 80 villagers were slaughtered in a 12-hour rampage in Algeria, according to Algerian newspapers. The brutal attacks were allegedly carried out by Islamic rebels. The worst attack occurred in Thalit village in Medea province, about 70 kilometers (45 miles) southwest of Algiers, where the guerrillas slit the throats of 52 villagers -- all but one of Thalit's residents. Witnesses said the attackers burnt their victims' homes after the massacre. Gunmen hacked to death 15 villagers in the Amroussa community in Blida province, 50 km (30 miles) south of Algiers. "The assailants broke into seven houses and cut up 15 people, including seven women and three children, with a chainsaw," Liberte newspaper said, quoting survivors. The paper said that some villagers were set afire as they tried to flee the attacks. In other attacks, five civilians had their throats cuts and seven were missing in Sidi Naamane; four family members were killed near the coastal town of Moretti; and rebels erected a roadblock near Beni Slimane, killing an unspecified number of automobile passengers. "They intercepted cars, picked up passengers and shot them dead at point blank range," reported El Watan newspaper. The weekend massacres took place after the Algerian army reportedly killed more than 100 Islamic guerrillas a week earlier. Algerian security forces are searching for the guerrillas ahead of the country's general elections, scheduled for June 5. The guerrillas have waged a campaign of violence since 1992, when Algerian officials canceled a general election when it became clear the Islamic fundamentalists had built a commanding lead. The country has been without an elected Parliament since that time. At least 60,000 people have been killed in violence since then. 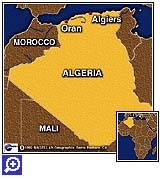 Algeria Travel Warning - U.S. State Dept.